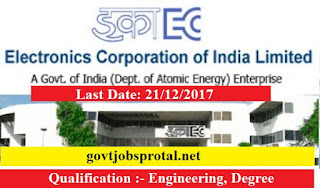 Electronics Corporation of India Limited , a leading public sector company under Department of Atomic Energy,Govt of india ,invites application from fresh Graduate Engineers for the post of graduate enginner Trainee. The selection shall be through Online Based Test Followed by Interview for short-listed candidates. The brief details are as follows. First class Engineering Degree with minimum of 65% marks in aggregate (55% for sc/sts) from AICTM approved Colleges/Recognized Indian Universities in the relevant discipline. Age :- Relaxations/Reservations will be followed as per the govt .Guidelines for sc/st/obc, pwd& Ex- serviseman from time to time. 2).Upper age limit is relaxed by 5 years for SC/ST and 3 years for OBC (Non-Creamy layer) candidates. In respect of PWD candidates, belonging to SC/ST the age relaxation is 15 years; OBC for 13 years and General for 10 years. 3). Upper age limit is further relaxed by 5 years for candidates, who had ordinarily been domiciled in the State of Jammu & Kashmir from 01.01.1980 to 31.12.1989. 1).Online application Registration starts on 01/12/2017. 2).Last Date for Online Application submission. 21/12/2017. 3).Tentative Date for Online Computer Based Test 07/12/2017. 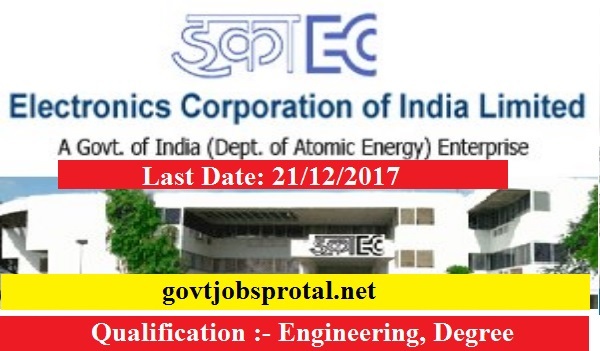 For Complete details, please visit our Website htt://careers.ecil.co.in or www.ecil.co.in. (You will get more information in employment News paper dated on 2/12/.2017 Page no.(3).) Visit the official website for more information.